Ah yes, the Sand People, Tatooine's gutter trash. Sure, it may be environmentally friendly and maybe even economical to use as little water as possible as you live out your days in the middle of Tatooine's harsh deserts. But come on, these guys are just plain rude. They see a teenage kid running around some canyons alone and do they offer to help him out? No! Instead, they hit him with a staff and start shouting in his face. Fortunately, they scare off pretty easy. The old man Kenobi just does a weird yell and off they go, the dummies. But you know what they say about Sand People. They'll soon be back, and in greater numbers. 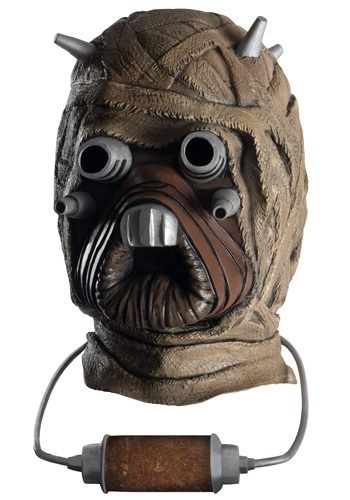 With such a danger to the community running around, there's only one thing to do: put this mask over your head and blend in! Maybe you don't speak Tusken Raider, but just improvise some guttural yelling and you'll probably be fine.